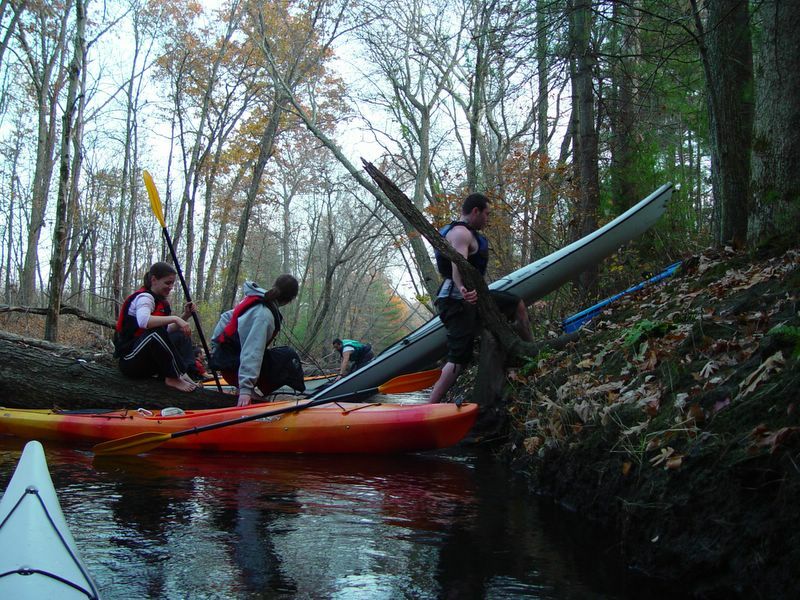 A little more than ten years ago a friend of mine planned a canoe day-trip down the Blackstone River. We started early in the morning and expected to finish around mid-day, so we didn't pack a lunch and just brought along a few snacks. As it turned out, due to the condition of the river (it was very low at spots and we ended up having to drag the canoe through the shallow water in many spots) we totally underestimated how long it would take to get from our starting location to our finish. As the day progressed and it became late afternoon, we realized we were still miles from our final destination. Fortunately, at one section of the river we ended up coming across some firefighters who were practicing with a boat. When they heard where we were headed and how much further we had to go, they offered to throw our canoe into a pickup truck and they drove us a lot closer to where we needed to be. Fortunately, we then ended up getting back to our car before nightfall and it all turned out ok. 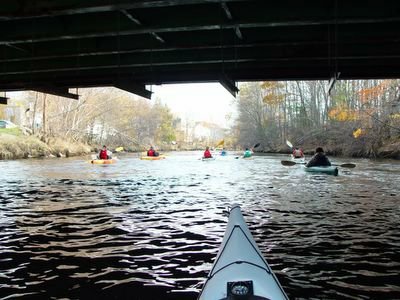 Yesterday, some friends of mine decided to plan a trip down the Blackstone River - there were eight of us in total. Since it was an afternoon trip and we knew we only had a few hours of daylight, the person who knew the river well picked a short route. So, around 2:00 we set off down the river. It turned out to be a very fun adventure, but it was not at all what we expected. Due to the recent heavy rainfall last month and the near flood conditions a few weeks ago, many sections of the river were obstructed with fallen trees. This made progress very slow as we had to either get out and drag the kayaks on land to go around, or carefully navigate through small openings in the river. The first fallen tree we encountered was very easy to go under, but I decided it might be fun to hang onto the trunk as I passed under it. That was a very bad idea. By grabbing onto the trunk I made myself totally off-balance. While my upper body stopped moving, my kayak continued to be pushed by the river current and I quickly found myself in my kayak floating upside-down down the river. Gah! How embarasssing! Fortunately, it was a warm sunny day, the water wasn't too cold, and I was wearing clothes that were designed to dry quickly (i.e all synthetics, no cotton). So, after emptying my kayak of water, it wasn't at all uncomfortable being wet. As we continued down the river, the conditions seemed to worsen and sections became more and more difficult to navigate. Two more people flipped their kayaks (a couple times each) while trying to get around obstacles in the river, and our progress was getting quite slow. Even though a few of us were now wet, and one person had lost their jacket, mobile phone, and pair of sneakers in the river, everyone was still having a lot of fun and spirits were high. (Plus, we had some dry clothes in reserve if someone needed them.) The main concern was how much further we had to go and how much daylight was left. As it started to get dark we encountered another obstructed section of river and one more person flipped their kayak. Another person (who had already fallen in several times earlier) tried to help the first person but ended up flipping his kayak as well. To make matters worse, his paddle also snapped in half during the ordeal and we could only find half of it. At this point we decided it would not be wise to continue down the river in the dark. The section of river we were on is part of the Blackstown River Park and there is a hiking trail that runs along the river bank. We knew this trail would come out where we parked some of our cars, so we began the journey of hiking down the trail carrying a bunch of kayaks. Fortunately, some of us had headlamps and flashlights, so we could see while hiking down the trail. I had also brought my GPS, so we had an idea of how much further we had to hike. This picture shows some of us taking a break after hiking up a hill with the kayaks. 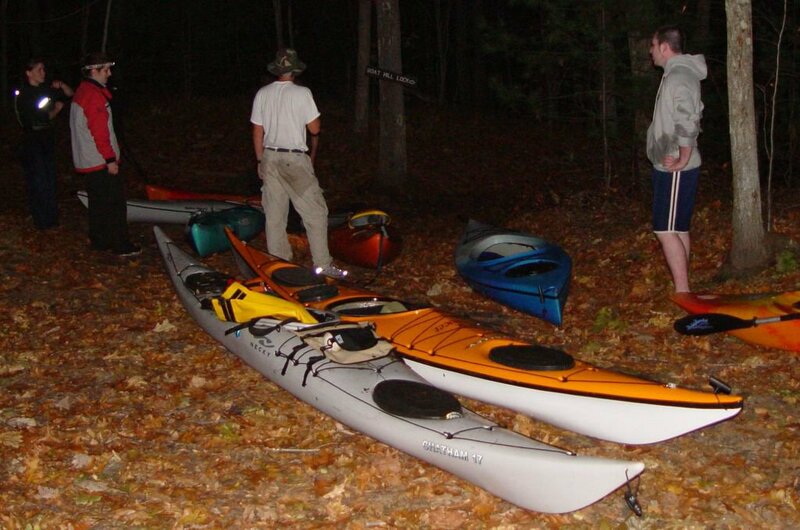 It's a pretty funny scene with some sea kayaks in the middle of the woods, in the dark, with no water anywhere in sight. As it turned out, we had to hike a little more than a mile to get back to the cars. Pack extra food and water In my first trip down the river ten years ago, I made the mistake of not packing enough food. It was assumed the trip would last a set amount of time and we hadn't planned for the unexpected. This time I learned from that and packed some extra snacks and extra water. (Also some of the other people in the group did the same.) As we never even expected to be hiking through the woods for an hour or so, the extra snacks and water was good to have. Bring extra paddles When I go kayaking solo in the ocean, I bring an extra paddle with me. You never know what might happen, and being in the ocean with no paddle is a bad thing. Going on a two-hour trip down a fairly tame river, I hadn't even thought of bringing an extra paddle. That was a big mistake on my part. Had we lost one of the paddles earlier on the trip, it would have made our progress even slower. I did bring a tow-rope, but I'm not sure how useful that would have been given the obstacle-strewn condition of the river. Don't wear cotton This is a mantra for anyone who is serious about hiking or kayaking: "Cotton kills" While warm and comfortable when dry, cotton is awful when wet. It stays wet and saps warmth from the body. You should always wear either wool (stays warm when wet) or synthetics designed to wick the moisture away from your body. Fortunately, we had enough dry clothes for those who fell in, but just barely. Next time I'll definitely pack more backup clothes in the kayak rather than leaving them in the car. Plan for the unexpected This is something a hiking friend of mine has always told me when going on hikes. Bring more than you expect to need. Plan for the worst case scenario. You can take this to an extreme and end up totally bogged down with too much gear, but it is good advice. And unlike with hiking, having extra gear in a kayak isn't that big of a deal. It's not like you'll be carrying the kayak down a hiking trail for a mile or so. Or will you? "Be prepared" is good advice. I always bring a first-aid kit with me on hikes and kayak trips. Thankfully, I've never had to use it. As for my car, I don't have any snacks or water, but I do always have a wiffle-ball and bat, a baseball glove, a couple pairs of inline skates, pads and helmet, a bunch of frisbees, a nerf football, and rock climbing shoes, harness, and a couple hundred feet of rope. You never know when you might need these things! 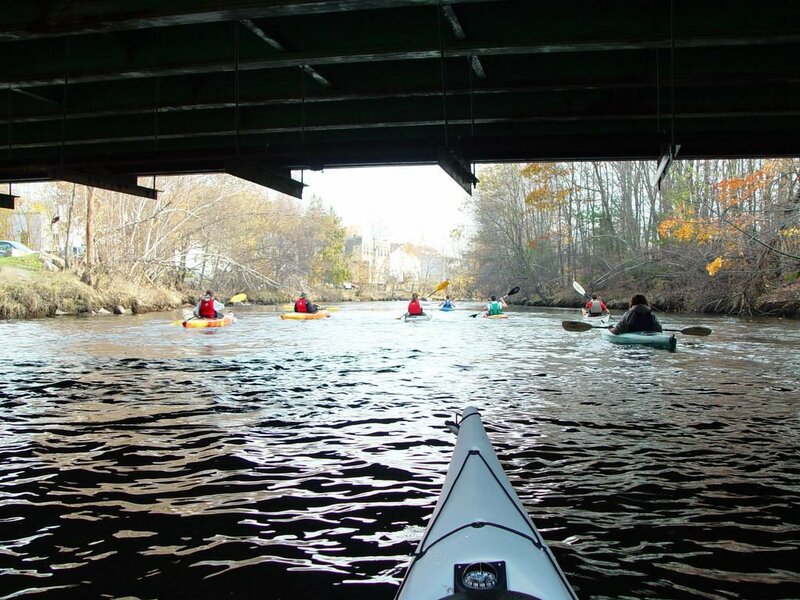 The third times a charm...you'll conquer thar river!